When the power goes out due to a thunderstorm, snow or grid failure, a generator can keep your home warm (or cool), let you cook in the kitchen, charge your smart devices and stay connected with the world. Apart from using a portable generator at home or job site to run a plethora of devices, you can also use it when camping outdoors. However let me warn you that the hunt for the best portable generator is not easy. There are different varieties and models of portable generator available in the market. First you need to decide upon the size that would be enough to meet your power requirements. To do this, you need to sum up the wattages of the appliances you wish to run. If you are okay with just keeping your food cold, smartphone charged, and lights on, then you need a small to medium sized generator. However, if you want to run an air conditioner or heating system then you need a large size. Here are a few more points to consider before buying a portable generator. Run time: Experts recommend that you look for a portable generator that offers a long run time (min 10 hours) at half load. The longer it runs, the less refueling it will need. Power outlets: Make sure the generator has enough type of outlets needed to run different appliances. If you wish to run a high wattage appliance then it must have a 30amp locking-style outlet. Portability: Portable generators are a good buy, so make sure the model you buy has foldable handles and wheels for extra portability. Low-oil shut down: Select a portable model that comes with a low-oil shut down feature which ensures that it shuts down automatically when the oil goes below level to prevent any damage. With so many different brands and models out there, it can be perplexing for you as a customer to choose one product. We have listed the top five portable generators to help you nail the buying decision. The Champion 3800-Watt Dual Fuel RV Ready Portable Generator comes from the house of Champion Power Equipment, a market leader in the field of power products. Since its inception, the company has relentlessly created efficient and durable tools for the US and world markets. The Champion 3800-Watt looks powerful with two wheels at the bottom for easy portability. The engine runs using propane or gasoline. It can generate 4275 starting watts and 3420 running watts using propane; and 4750 starting watts and 3800 running watts using gasoline. The generator is also battery powered to enable an easy one-touch start. It comes with a propane hose and internal battery charger which charges the battery while the equipment runs. This generator also features Volt Guard, which is a surge protector that is built into the generator panels. It protects your appliances when there’s an unexpected voltage spike or surge. The manufacturer offers three years limited warranty which is slightly tricky as there are selected free services within the warranty period. The Champion 3800-Watt Dual Fuel RV Ready Portable Generator is a powerful and well-designed piece of equipment that can run on both gasoline and propane. We like the sturdy exterior and wheels which make it easier to move the equipment from one location to another. It can be installed within 10 minutes and made ready to use. The only disappointment is the limited three years warranty which offers only selected services. If you can ignore that, the Champion 3800-Watt is one of the best portable generators money can buy. When it comes to portable generators, the name of Sportsman stands tall. The 1000 W Portable Generator belongs to the Sportsman Series, which is a reliable source of power for home or outdoors. 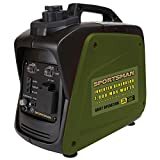 Whether you are looking for a generator to use as a power backup at home during emergency situations or to keep your tablet, smartphone and television running while you are camping outdoors, this product offers the sufficient power you need. The generator is powered by unleaded gasoline and it can safely run a wide range of devices such as a television, computer, DVD player and many more small appliances. It can produce 1000 peak surge watts or 800 rated running watts that can be used both at home or on job sites. The sine wave provides stable, clean voltage, and reliable power that is safe for even the most sensitive appliances at home. It comes equipped with one 120V AC outlet and one 12 Volt DC outlet for battery charging. The Champion 3800-Watt Dual Fuel RV Ready Portable Generator is a lightweight and compact device that is built specifically for camping or outdoor use. It can power lights, charge your phone and run one large fan. It cannot produce adequate supply to run a lot of appliances at home. It is a great choice if you are a bachelor or someone who frequently goes camping. It comes with just a one-year limited warranty which is a letdown, but at this price we cannot really complain. Overall, we think it provides a good price to performance ratio. The Poweradd ChargerCenter Portable Generator is special because it is the first Ultimate Portable Power Supply by POWERADD. The brand is known for making reliable power bank chargers, external batteries and USB chargers. Does the ChargerCenter stand up to the high expectations we have from this brand? Let’s find out. This is a compact 50000mah multi-voltage portable charger which is designed like a classic lunch box with a handle on the top making it easier to carry anywhere. It is made from high quality components. According to the manufacturer, the product has a drop-tested aluminum shell which makes it perfect for outdoor adventures. It also features a Battery Management System (BMS) which nullifies any potential risk of damage. The ChargerCenter boasts high capacity and can provide up to 16 charges for an iPhone 7. It can serve as a backup power for emergency lightning, outdoor, camping, SOS light, and field work on job sites. It comes equipped with triple output modes which include a 12V car socket, 3 fast-charging USB ports, an 110V AC outlet and a quick charge outlet. If you are looking for a small sized portable generator that can be charged easily then the Poweradd ChargerCenter is a good choice. It can be charged using a solar panel in the absence of electricity. The Battery Mangement System (BMS) ensures that you can make optimum use of the battery and prevent over-temperature, over-voltage and over-current. It also comes with an advanced Texas Instruments (TI) chip which guarantees complete protection for your appliances. We feel this is a good choice for those who need backup power for camping or just to power a few lights and devices. The Webetop Portable Generator is a mini generator but it impresses with its high capacity. It boasts a large power capacity of 42000mAh rather than 40800mAh and built-in USB and DC ports. We like this device because it comes with a variety of outputs such as one 110V Dual AC outlet, three 12V DC ports, and three 5V USB ports. This generator works as a perfect emergency power backup for home or travel use. This generator can be charged in multiple ways. It can be charged using a car charger, wall outlet or solar panel. So as long as there is sun, you don’t have to worry about charging the generator. On a full charge, the inverter can run for a maximum seven to eight hours. It can charge a laptop, multiple phones, RC helicopter and power small electronic devices. It also comes with a bright and powerful LED flashlight that can run for 125 hours. It works great for outdoor lighting or emergency situations. The BMS (Battery Management System) ensures full battery utilization, prevents overheating and short circuit. It also ensures complete protection. 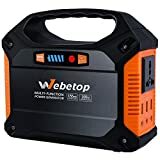 If you don’t think you need a portable generator to run an AC or heating system and you are happy with just keeping the lights on and phones charged then the Webetop Portable Generator is a good choice. It produces more power than you can expect from this small device. It can be charged in multiple ways which is a great advantage. It also comes with a flashlight which is a bonus. Overall, we feel it offers good value for money. 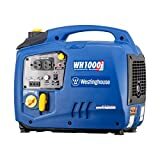 The Westinghouse WH2200iXLT Portable Inverter is from a company that has established its reputation in the industry of power equipment for over a century. The bright blue color and compact design of the WH2200iXLT gives it an attractive appearance. However it’s not just the looks but the performance that makes this device a real star. The generator is so lightweight that you can carry it with you anywhere you want. It features a 1.3-gallon gas tank which can last for a maximum 13 Hours at a 25% load. So this means it can run all night while you are camping outdoors. Another benefit of buying the product is that if you already have a Westinghouse Digital Inverter Generator then you can combine it with this using a parallel cord to get more wattage. The Westinghouse WH2200iXLT Portable Inverter is a reliable and easy to use generator that comes with a plethora of innovative features. It works as a perfect emergency backup at home or at a camping site. The multiple power outlets ensure that you get the high quality power that you need to run all appliances. The three year warranty is slightly tricky with several clauses but it is compensated by the lifetime technical support. The five portable generators listed above are all good in their unique ways. However, it all depends on your requirement and the ‘need’ you want to be fulfilled with your purchase. If you are looking for a high capacity portable generator to run several appliances at home during a power outage, we think the Champion 3800-Watt Dual Fuel RV would be the right choice. It runs on both gasoline and propane. is easy to use and delivers a good overall performance. It is the kind of device you can rely on if you live in a place that’s frequently impacted by hurricanes or storms. When you want a less capacity generator to use for camping and travel, the Poweradd ChargerCenter Portable Generator makes a good choice. Although small in capacity, it packs a powerful performance. It can be charged in three different ways which adds to convenience and as long as there’s solar power, your generator will never run out of charge. We hope the above list helps you find the best portable generator that perfectly meets your personal requirements.